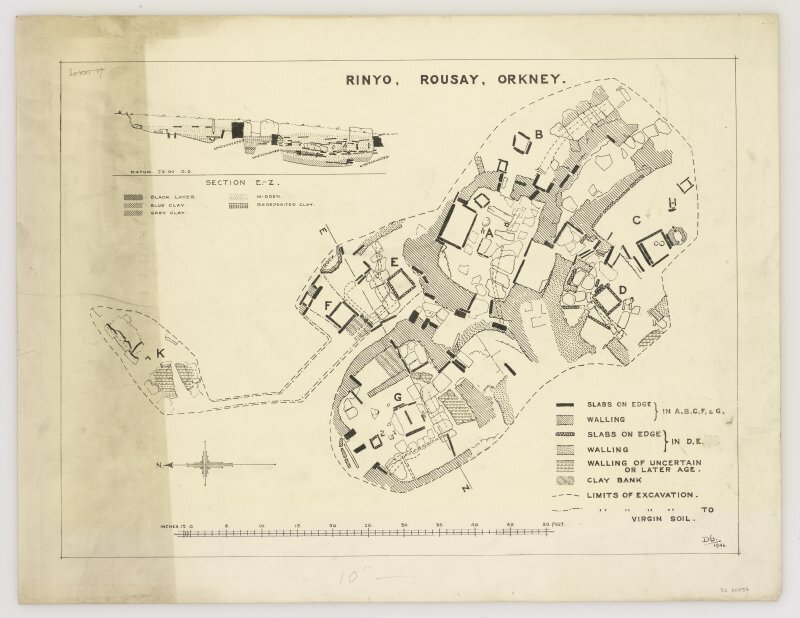 Plan of Neolithic house G at Rinyo, Rousay. 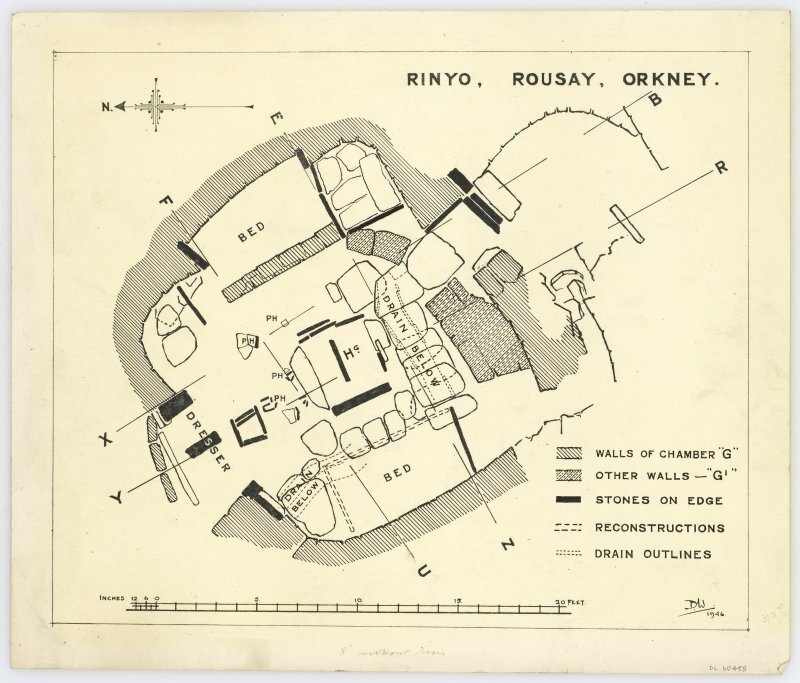 Plan and section of Neolithic settlement at Rinyo, Rousay. 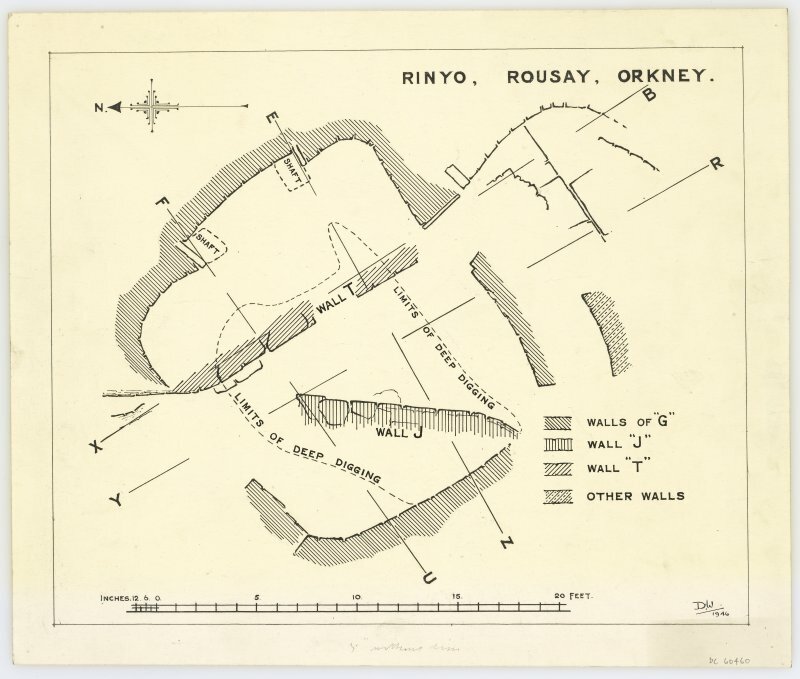 Plan of structures beneath Neolithic house G at Rinyo, Rousay. 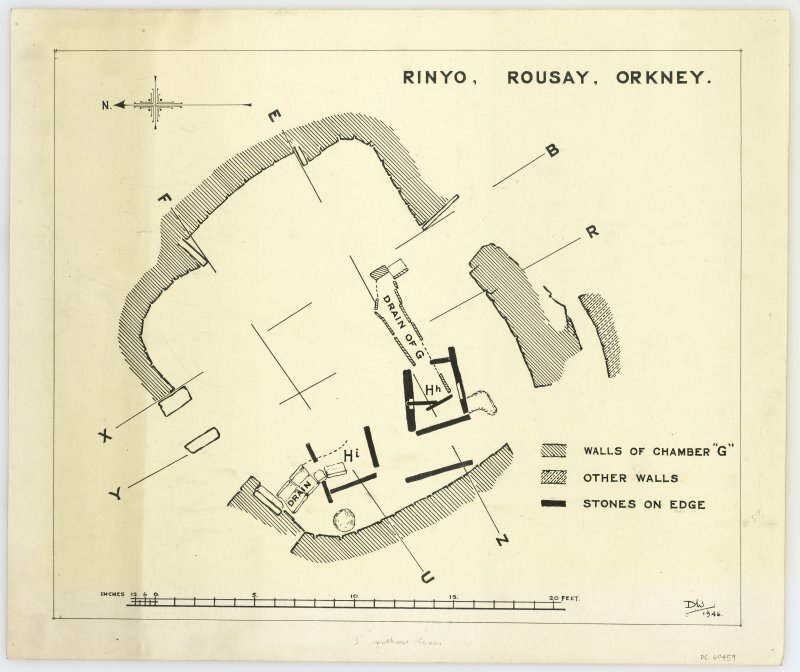 Plan of deposit below Neolithic house G at Rinyo, Rousay. 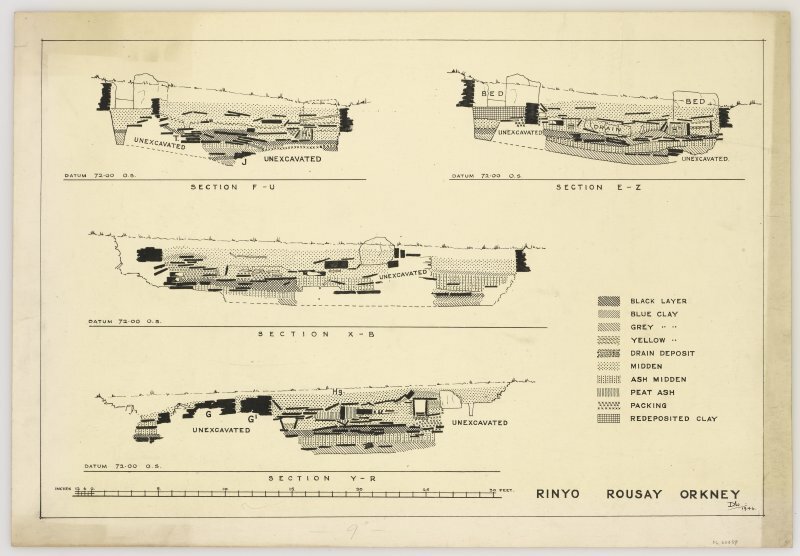 Sections of Neolithic settlement at Rinyo, Rousay. For comparable settlements at Skara Brae (Mainland), Barnhouse (Mainland) and Pool (Sanday), see HY21NW 12.00, HY31SW 61-2 and HY63NW 17 respectively. 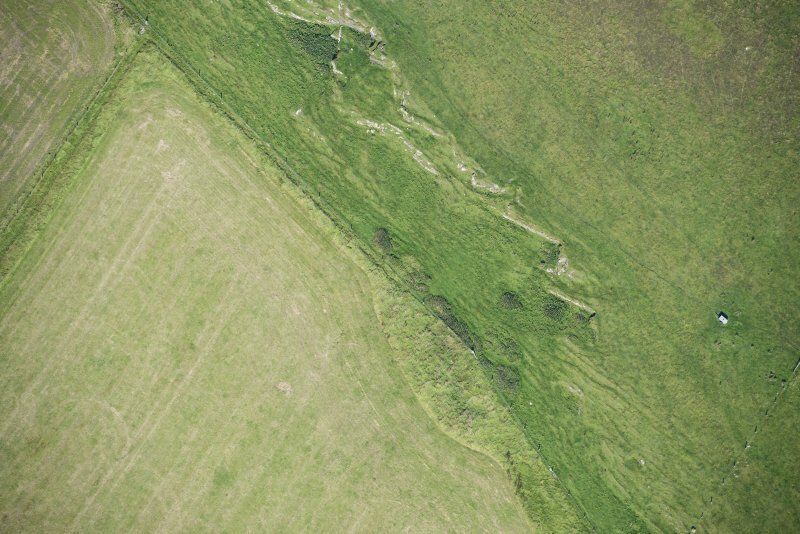 (HY 440 321) This Neolithic settlement, type site for the Rinyo-Clacton Culture, was excavated in 1938 and again in 1946 by Professor V G Childe and W G Grant. 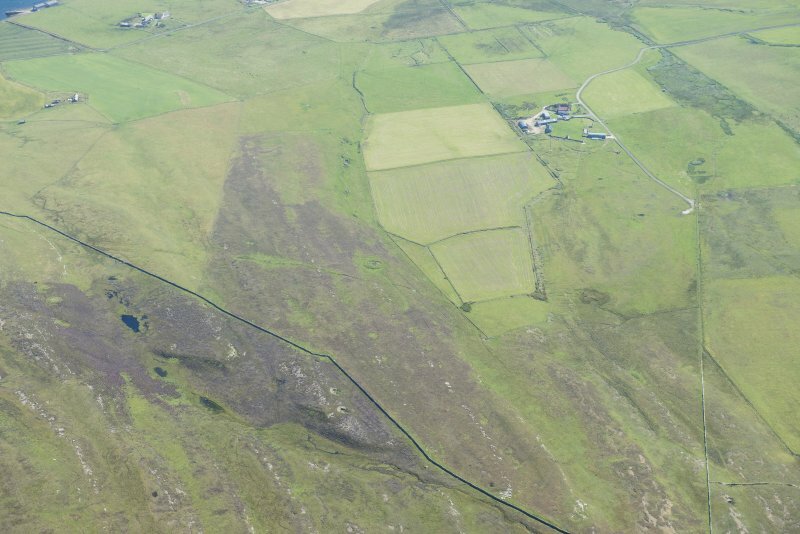 It was found to be very similar to Skara Brae (HY21NW 12.00), 15 miles away to the SW. The finds consisted of numerous pot-sherds, including some of beaker ware, 250 flint implements including a polished knife; stone axes and balls, an 'ovoid B' stone mace-head, a mortar and potlids, most of which were presented to the National Museum of Antiquities of Scotland (NMAS). V G Childe 1939; RCAHMS 1946, visited 1936; V G Childe 1949; R W Feachem 1963. The Beaker sherd held from Rinyo is held in the NMAS under accession number HDA 99. It is assigned to Clarke's N3 ('Late Northern British') group. The Rinyo settlement at HY 4398 3224 has been filled in and only a few slabs on edge and some fragments of drystone walling protrude to mark the site. Visited by OS (ISS) 18 October 1972. Excavated by Childe and W G Grant in 1938. Further excavations took place in 1946. Excavated by Childe and W G Grant. 38 and 1946 (Childe and Grant 1939; 1949). much of the rest of the survey area.